We provide solid technical consultation and maintain an ongoing dialogue to ensure that we meet your needs, budget and schedule. In achieving this goal, our crew views their responsibility personally for ensuring your safety and satisfaction. Through this approach, we build the enduring, trusting relationships that enable our customers to rely on us year after year. 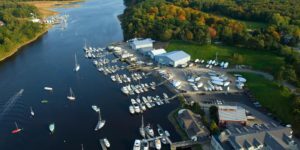 Yankee Marina & Boatyard, a family-owned, full service marina is in its 6th decade of providing the highest quality marine and specialty technical services to boaters. We are located on 6 acres along the protected west bank of the Royal River in beautiful Yarmouth, Maine. Our location provides a natural defense from threatening winds and high seas.